CDAC was featured prominently in the 2013 Stockpile Stewardship Academic Programs Annual Report, which was released just prior to the recent SSAP Annual Review Symposium. 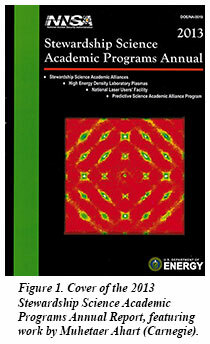 The cover of the report featured an image of diffuse x-ray scattering from Pb(Sc,Nb)O3 obtained by Carnegie-CDAC Research Scientist Muhetaer Ahart. The diffuse scattering, which was captured with a CCD detector during a high pressure experiment at beamline 16-ID-B at HPCAT, provides important insights into the dynamics of ferroelectric materials. An article on HPCAT showcased opportunities for NNSA science at the APS featuring the diffraction and spectroscopy facilities at HPCAT. A companion piece described the unique capabilities that will be afforded by the DCS sector now under construction. 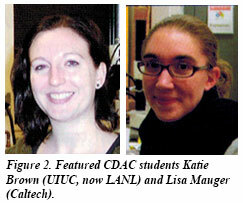 In addition, current CDAC student Lisa Mauger (Caltech) and former CDAC student Katie Brown (UIUC, now LANL) were both profiled in the report. Mauger and Brown both described the important role that CDAC support has played in the development of their scientific careers.